My husband and I planned a camping trip to Waldo Lake. It was a place he’d heard so much about but hadn’t yet visited. About a three weeks before our reservation, we received a notice from the campground that there would be no fresh drinking water available due to a broken line which wouldn’t be fixed in time. We could cancel our reservation with a full refund or continue on and make due by bringing our own water or filtering the lake water. Heck, we’ve been backpacking and have had to filter water before. Not to worry, we would figure something out and press on. John and I had only ever used hand-pump water filters for backpacking. They are a lot of work for not much gain. On a previous backpacking trip, a friend of ours had brought along a Platypus brand gravity fed filter system designed to hang from a tree. He was KING of that backpacking trip. We took turns filling his water bag and letting his filter do the leg-work while we cooked, chatted, and slept. 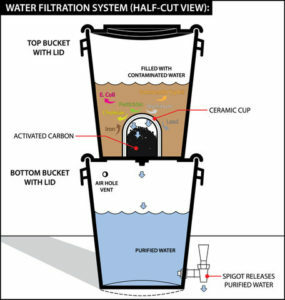 Gravity-fed filters… now that’s the way to go! Before embarking on our camping trip, I scoured the internet looking for more gravity-fed filtration options. Lo and behold, I found a video of how to assemble a home-built system. 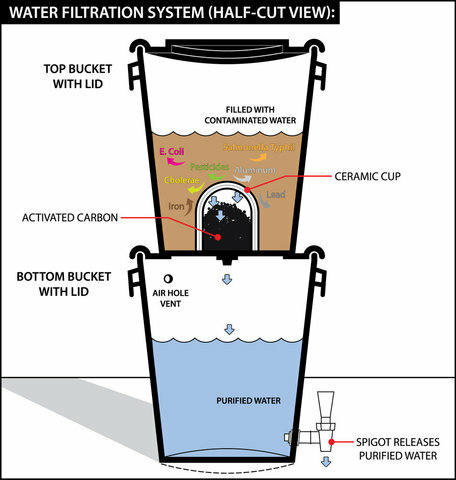 This two-bucket ceramic gravity-fed filter system would be a perfect solution for car camping. We built it and used it successfully on that trip. I realized this system would work perfectly in our home preparedness kit. We have rain barrels around our house and intend for that to be our water source. But drinking THAT water — uggh! It would need to be filtered. After talking to more people, there were concerns about the level of sanitation. How many microns? What about viruses? It turns out that ceramic filters only filter, which is to say they remove particles and bacteria – not viruses and chemicals, so purification is still required. I’ve since found that Berkey filters can purify to the virus level as well as iodine tablets. We haven’t tried it out yet, but that’s our next step. Or we’ll just boil whatever water we don’t trust to drink. Have comments or want to share your findings? Share them with the PortlandPrepares Facebook Group.